Enterprise fleet maintenance management can either make or break a fleet manager’s career. Why? Great maintenance makes fleet managers look like superstars because the fleet is productive and runs at a low cost. Bad maintenance, meanwhile, will cause a fleet to miss its productivity targets and ultimately force fleet managers to look for a new job. Thankfully, fleet managers use a few tools to help them monitor enterprise fleet maintenance. For instance, managers use anything from basic monitoring reports to advanced engine diagnostics. Basic GPS data. 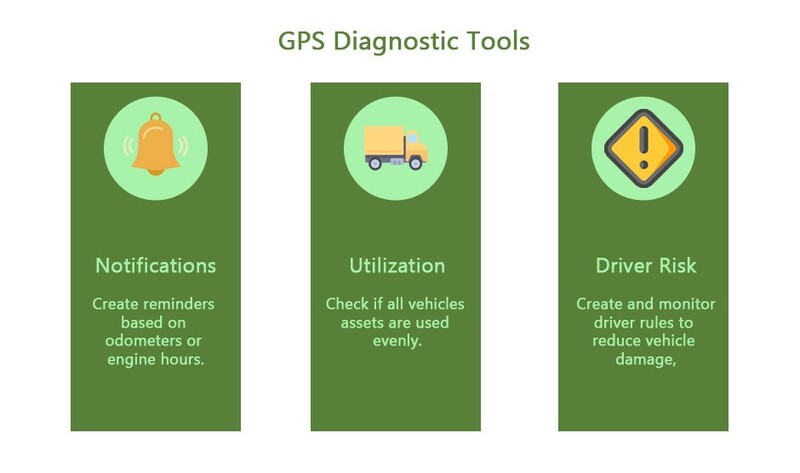 A lot of fleet managers collect GPS data such as vehicle location or driving habits to plan maintenance and monitor risk drivers. Engine diagnostics data. Fleet managers also use advanced engine diagnostics to get more data and proactively plan maintenance. We will discuss how fleet managers use both basic GPS data and engine data to improve enterprise fleet maintenance management. Firstly, fleet managers can use basic GPS data for better maintenance. Basic GPS data is simple, yet, effective. Here are some examples. Maintenance reminders are one of the important GPS data because it springs the entire team into action. For instance, managers might schedule check-ups by either vehicle usage or by period. Fleet managers can then use GPS to keep track of odometer or time data and schedule regular maintenance. Next, fleet managers need to collect data to distribute fleet utilization. For instance, while fleet managers would love to order the newest trucks, they would probably get into trouble if they order new trucks while old trucks are sitting in a yard. For that reason, utilization reports contain useful GPS data that organizes the fleet’s resources. Fleet managers can see and use under-utilized vehicles rather than buying new trucks or burdening the other fleet trucks. Finally, fleet managers use GPS data by taking a look at driver reports. Bad driving increases a vehicle’s wear and tear, and in turn, increases downtime. Some fleet managers use driving event rules to evaluate and train risky drivers. Secondly, fleet managers use engine diagnostics data to refine their enterprise fleet maintenance management plan. 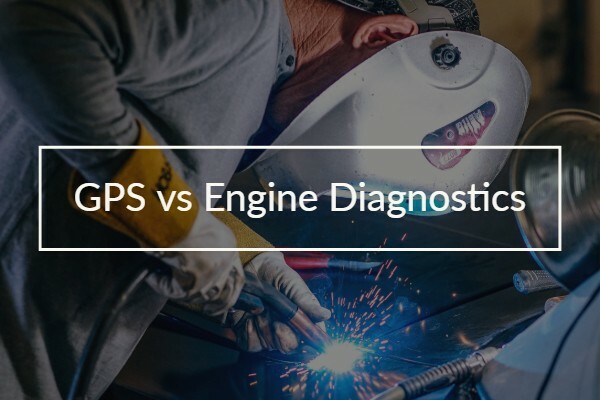 Engine diagnostics dig a bit deeper than basic GPS data. Geotab’s data engineers partnered with OEMs to collect more data and codes from engines. Here are some examples of additional data. GPS odometer readings might be different from “True” Odometer readings. That’s because GPS odometers draw their data from location data whereas True Odometers draw their data directly from engine use. Why are True Odometer readings more accurate? The answer is idling. Idling uses the engine which causes wear and tear. Therefore, fleet managers should absolutely consider idling data when planning regular checkups. However, they would not get access to this data from GPS odometers because the odometer does not move when vehicles are idling. True Odometers, on the other hand, solves the idling data gap and schedules maintenance based on actual wear and tear. 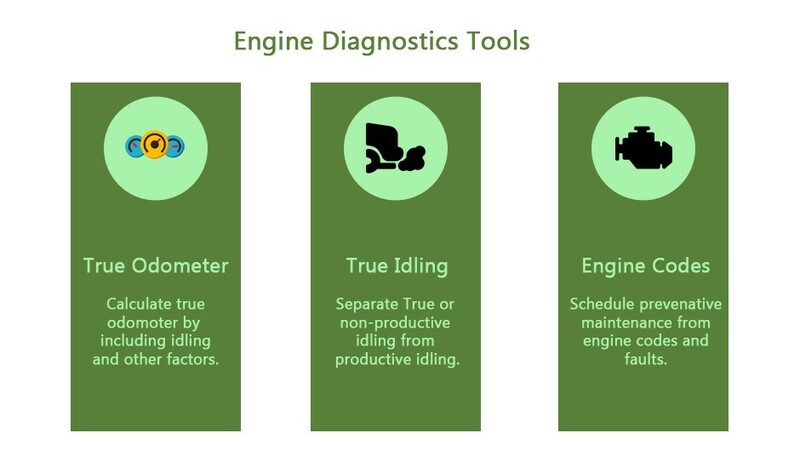 Speaking of idling, another important engine data measurment for fleet maintenance management is True Idling. Idling should be classified into two categories – productive idling and unproductive (or “True”) idling. Sometimes, idling might be productive. For example, garbage trucks idle when they use their containers. However, this idling is productive because that’s how garbage trucks collect and dump waste. How can fleet managers separate idling? Geotab devices measure productive idling when the vehicle idles but the PTO, or auxiliary equipment, is on. Everything else is considered unproductive idling, or True Idling. From there, managers can identify and train True Idlers to protect vehicles from wear and tear. Last but not least, engine code data are used to manage maintenance. This is perhaps the most powerful data because it allows managers to proactively find and fix issues. First, it covers engine faults. GO Devices read and report engine faults while non-users have to take their vehicles to a shop to read engine codes. As a result, fleet managers can view a log of all issues and decide when to send their vehicle to service. Second, it covers engine readings. Managers can use their technical expertise to turn engine readings into powerful preventative tools. For example, cranking voltage is the amount of voltage needed to start a truck. Managers can create a warning whenever cranking voltage goes below a certain number. Click here to review ZenduMA, a powerful diagnostics add-in for enterprise fleet maintenance. Geotab: Engine Diagnostics or GPS Only Tracking: Which is Better?